Our Emergency Response is designed to cater to our customer's Emergency response needs involving highway, Rail, industrial, air and marine emergencies Internationally. Our focus is the emergency termination of your chemical incident. We provide resolution to these incidents through incident control and termination, remediation, and necessary follow-up. The strength of Gianco lies in its ability to work with Local, State and Federal regulatory Agencies to insure that it's clients comply with environmental regulations while providing cost effective solutions. Gianco strives to be a partner with its clients and contractors where compliance and safety are concerned. 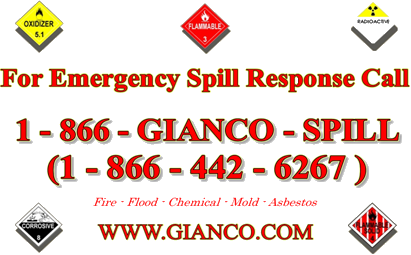 Gianco delivers safe solutions to complex and hazardous situations.